I picked M.C.A. Hogarth‘s Earthrise up from Amazon when it was free. It was still free at the time of posting. I’m torn how to feel about this book. It’s easily readable, has an interesting universe and I very much enjoyed all the side characters (including Unpronounceably Named Male Lead). But I never came to like Reese. Not even a little bit. I understood that she wasn’t really meant to be a b*tch, but she was. She was so prickly that she pushed everyone away, even me, the reader. I kept hoping that she’d come around and settle down to likable. After all, there are generally expected arcs that such books usually follow. I sense that this series will too, but it didn’t happen in this book. I kept thinking and being bothered by the idea that if she was a male captain, no author would have written her to be so coddled by her crew. They’re constantly sending her away when things get intense. The stress of leadership was literally eating a hole in her stomach. And she’s angry all the time, because she can’t express herself any other way. There was also some uncomfortable language. Hogarth uses food to describe skin tones (admittedly for both black and white characters), which is understably a no-no, and Unpronounceably Named Male Lead thinks of Reese as looking exotic, several times. Which might not be so bad if he wasn’t a white man, her a black woman and they weren’t standing next to cat-people, dog-like people and a talking Phoenix. Kind of sure, being a black woman doesn’t make her the exotic one in those circumstances. Lastly, the plotting is very linear. Reese is hired to rescue someone. She and her crew go right there and get them. Then she immediately has a medical emergency that they are miraculously on hand to fix and then they just go off on their next adventure. There are no red herrings or diverting paths to liven things up a bit. Having said that, I appreciate there being a person of color as a lead character, even on the cover, and I was entertained throughout the book. I’d be happy to read another one. 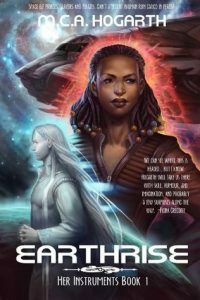 This entry was posted in books/book review and tagged book review, free, sci-fi on April 15, 2018 by Sadie.